© 2005 Ishimori Pro • Toei Company Ltd.
Masked Rider made a dashing first appearance on television screens on 3 April 1971, facing off against the phantoms sent out by the evil secret society Shocker. Masked Rider 1, Takeshi Hongo and Masked Rider 2, Hayato Ichimonji were adored by youngsters, becoming their heroes beyond all others. 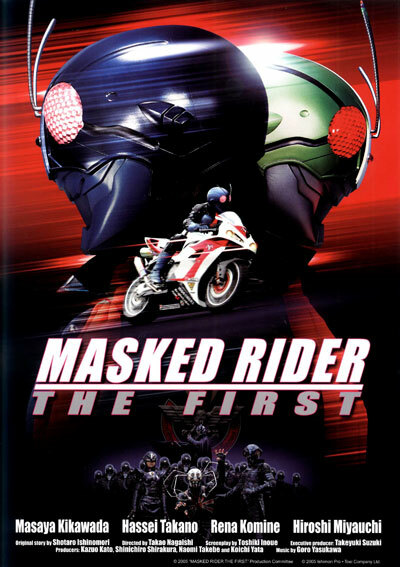 "MASKED RIDER THE FIRST" is an adaptation of the original comic book by Shotaro Ishinomori. This new work tackles head-on the drama of the cyborgs known as Masked Riders that Ishinomori was trying to depict, and has been created as a movie fitting for the year 2005. In other words, this work is neither a sequel nor a remake, but a first visual image of the Masked Rider - truly a creation worthy of the title of THE FIRST. Takeshi Hongo is a person of extraordinarily keen intellect - a young man with great promise for the future. But that future is snuffed out by a secret society called Shocker. They use cyborgs created in all manner of experiments in an attempt to take over the world. Hongo is made into a cyborg with the abilities of a locust - Masked Rider 1 - . However, through sheer luck, Hongo is able to return to himself, and realizes that he is being controlled by evil. He also learns that he can never return to his original form, which causes him great sadness and gives him fears of his own power. Meanwhile, Shocker views the escaped Hongo as a traitor and sends off a new cyborg after him as an assassin. The assassin has the same powers and appearance of Masked Rider 1. His name is Hayato Ichimonji - Masked Rider 2. But with their opposing powers there is no conclusion to the fight and they only succeed in hurting each other.